RIVERHEAD, Long Island -- Kids often dress up when they go see Santa Claus at Christmastime, but what would you expect penguins to wear? 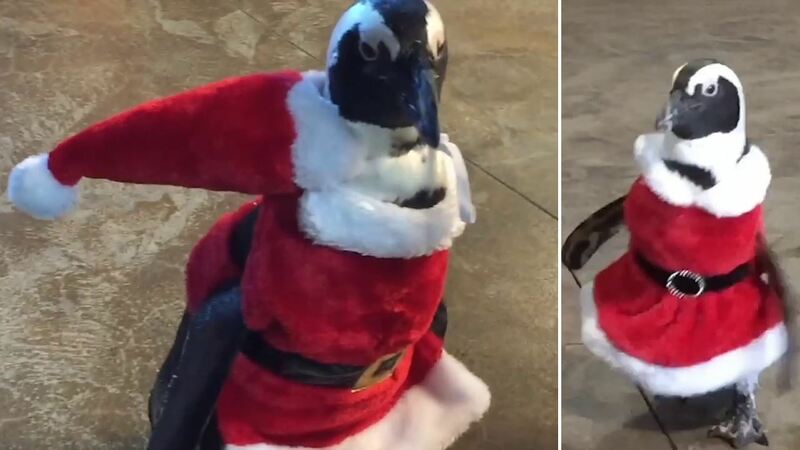 The Long Island Aquarium and Exhibition Center released video this week of African penguins dressed in their holiday best. The workers there put the penguins in red and white suits for their visit with Santa. Staff at the aquarium said the penguins seem to enjoy these dress-up sessions. "It's something a little different from their norm, so it's good for them to get this opportunity to get out of exhibit and expand their horizons a bit," said one of the workers. The worker said only the penguins comfortable with dressing up participated. Any that seemed to get stressed during the activity were returned to their habitat and given a snack.